Is your QMS part of your business strategy? If I’m 100% honest with myself I would have to say I’ve heard that question a thousand times before, but I guess it’s just the way the world works… sometimes the penny drops and sometimes it doesn’t. Clang klink klink. For me, this time it did. It took place in 3 Moves. Over the past year if you asked me to name the top reason why Lean and Six Sigma implementations failed in organisations I would have rattled off without missing a beat, “It’s because they not aligned with strategy”. It makes logical sense. But what the heck the practical part of aligning your quality initiatives with your business strategy actually entailed doing, was beyond my grasp until a few days ago. In a workshop on the new ISO9001:2015 it started making sense when one of my fellow workshop attendees (a Risk Manager) said a way to measure risk is to look at your company objectives and consider the risk associated to those objectives. Up until that point, I’ve only been able to “see” or recognise risks associated to individual processes. I wasn’t able to understand what macro level “business risks” were, and what they had to do with quality. The Objectives are the key. More specifically, “getting in the way of your objectives” was key, Thank you Simon. That was Move 1. Then Move 2 was later when the workshop presenter hammered the point, “The main purpose of a QMS is to help the company make a profit”. “It is Not the customer is king” he added, “but it is make a profit first and satisfy your customer while you doing that!” and then he asked “Are your business objectives the same as your QMS objectives?” Kachow! The distinguishing characteristic of the new version ISO9001:2015 is the new Clause 4 which takes a closer look at the context of your organisation. This means that to a certain degree you are not only allowed to, but you must appropriately tailor the requirements of the standard during implementation to suit the needs of your organisation. There’s no place for the one size fits all quick and dirty sales pitches that certain certification consultations took advantage of. The days of making a quick buck off someone who didn’t really understand quality but wanted a quality stamp of approval will hopefully soon be gone. And finally Move 3, happened while shampooing my hair in the shower this morning with good old Pantene for damaged and dry hair. So after my last consultation with Prof regarding my D. Tech research I knew I was gonna have to figure out a way to measure Operational Excellence. That’s what our counterparts in the research group in Europe are doing. I once came across an Aristotle quote which said “We are what we repeatedly do, therefore excellence is not an act, it is a habit”. I whole-heartedly agree with that sentiment. 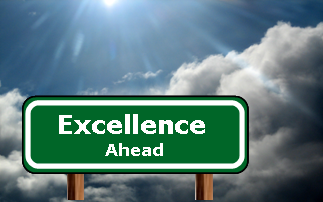 With that in mind, would meeting SMART (specific, measurable, achievable, relevant, and time-bound) objectives time and time after time after time…..would that be excellence? I think so. The critical thing is to set proper objectives. Business objectives that are also simultaneous your quality objectives. And put quality systems in place to meet and exceed these objectives time after time after time. Keeping in mind, an objective is not stagnant. Periodically you have to raise the bar, update the objectives to give your business the competitive edge. Keeping a record of how you met these objectives….would that be measuring operational excellence? As a consultant who has worked with 9001 since the good old days of :1987 I hope I am not the last to say that :2015 is a prime example of how to overthink something that should be beautifully simple. Since the :2000 version it has been obvious (to me at least) that the management of quality has to be an integral part of total business strategy. The ridiculously obscure language in :2015 shows how abstracted the writers of this standard have become. Must go and lie down somewhere before head explodes.